Reviewed by Phill Hunziker. Viewed at the Chinese Theater, part of the AFI Film Festival 2015. Let’s be honest. The only reason this film made it in the festival was because the great Mel Brooks produced it. There is talent on screen, for sure, but it is wasted on a frustratingly formulaic script and awkward/bland cinematographic execution. Thanks to a mostly solid cast and satisfying third act, though, this won’t be the worst film you ever see. Set in NYC, one-dimensional misogynist and super-douche Sam (Brock Harris) spends his life sleeping with women, making that money and busting the chops of his lifelong best friend Doc (Sean Kleier). After stumbling into a little shop in a drunken stupor, Sam is called out on his disdain for women by The Shopkeeper (Stacy Keach) and is sent on his way after receiving a mysterious drink. He wakes up, the next day, as a she (Natalie Knepp). From there, Samantha begins life both trying to reverse her curse then, at first, reluctantly adjusting to life as a woman. Her eyes and heart start to open up after she experiences the same sexism and harassment she used to dish out on a regular basis. Doc, his/her confidant, nearly blows a gasket trying to wrap his head around the situation while staving off his sweet but controlling fiancee Cynthia (Sarah Scott). 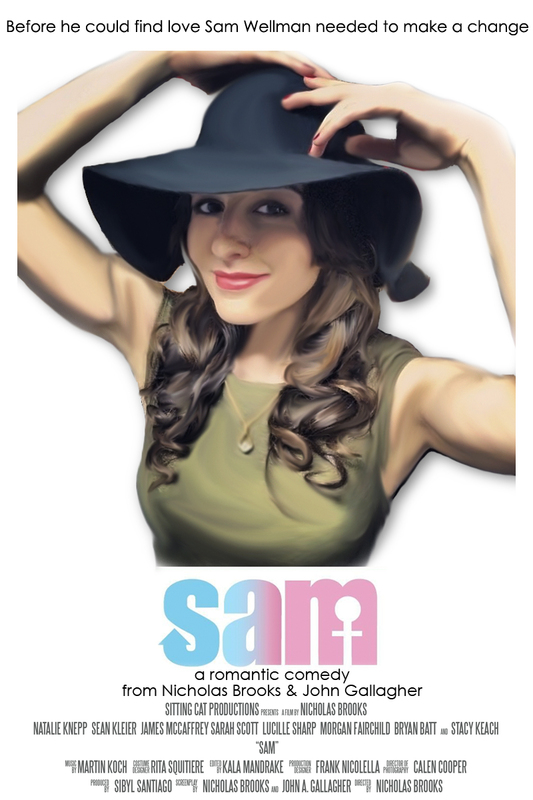 The development of both Samantha’s transition into a woman and her complicated but budding relationship with Doc are the main points of focus in the narrative. The premise is great, which makes the execution that much more disappointing. The lighting, set designs, camera movement and placement were both lazily put together and straight-up bland, even by romantic comedy standards. It is not clear whether the filmmakers have an ugly, unimaginative style or no style at all. What is most frustrating about this film are the series of stale jokes that fall flat on their faces. I can recall dozens of times in which some sort of insensitive, ironic or plain cheap one or two-liner would draw absolute silence from the crowd. That’s not to say there aren’t funny moments. The script itself picked up in the third act by essentially putting the film in the hands of its now-mostly developed characters. The first two acts, however, held about a 9:1 miss-hit ratio. Some of those moments, though, were risen to a passable status thanks to the charisma of the leads, the awkward creepiness of Sam’s boss Seymour (James McCaffrey), and the pure wit and comedic timing of Samantha’s stylist Alexander Blondell (Bryan Batt). Natalie Knepp particularly stood out. Her initial impression of a d-bag’s first day in a woman’s body was over the top but effective. The development of his-to-her character is the most rewarding aspect of the film largely due to her ability to smoothly change her tone, body posture, facial expressions and mannerisms over time. She displayed solid comedic timing as well as a knack for exemplifying heartwarming humanity. If there was only one good reason to see this film (and it seems that way), it would be to see the early work of a future star. Great review! I agree with you on the fact that Natalie Knepp really stood out in this film, and she put on an entertaining performance. I do think the film could have been much better, but I did find it to be entertaining and good for a few laughs.